Donald Trump visited the UK this week and met several important people, including the Queen and the Prime Minister. Join Sian and Clare to find out more about this story - and to learn 3 useful words from the headlines to talk about having visitors. 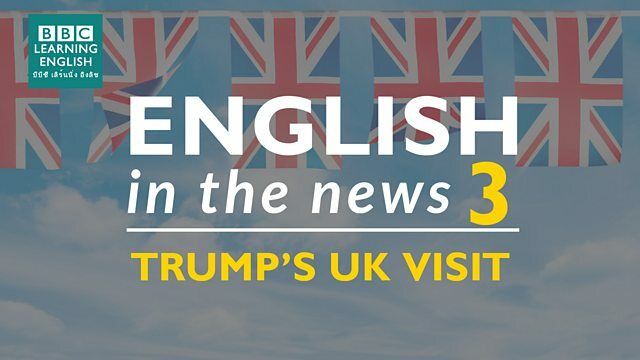 Donald Trump visited the UK this week and met several important people, including the Queen and the Prime Minister. Join Sian and Clare to find out more about this story - and to learn 3 useful words from the headlines to talk about welcoming and inviting people. Not only people are hosts. Which sentence using the word 'host' is NOT correct ? You need a word that means 'to welcome someone with particular words or a particular action'. When you meet new people in the UK, it is often common to ______ them with a handshake. Sian is going to ______ for Clare next time she visits the UK!